This is the fifth article in our series of blog posts on notable updates from the requirements management (RM) tool market that happened since September 2014. It features updates concerning Testtrack RM from Seapine. Since our last update Seapine delivered several on-premise versions, namely 2014.1.2, 2015, 2015.01. From a RM perspective these versions focused on stability and housekeeping, no major new functionality. 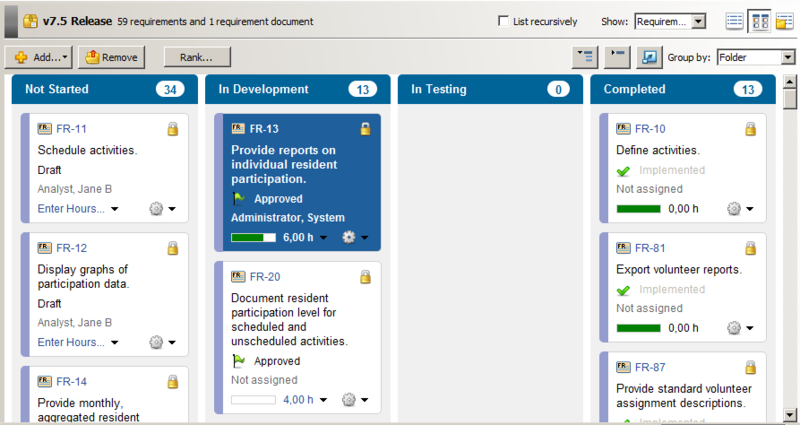 Noteworthy is the ability to configure interactive task boards based on folders. This allows for progress measuring on sprint, release, or other milestones. Items can be grouped in swimlanes based on folder, user, relationship, or requirement document. Seapine is one among few RM tool vendors which recognized that taskboards are a powerful tool not only for agile development, but also for traditional development methodology.